Looking forward to the 50% off deals in January? This year, we’re going one better. Literally. 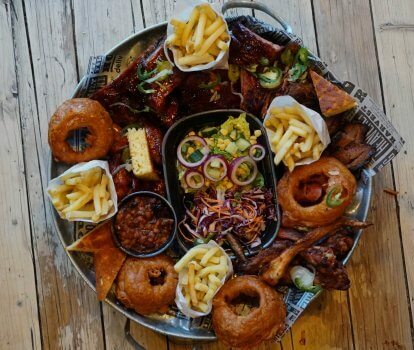 Come forth and beat the January blues in 2019, with a whopping 51% off the food menu all through the month of January at Red’s True Barbecue when you pre-book a table. Whether it’s a Pit Burger, a Brisket Tray or a full-blown Feast, you can enjoy a blow out in the New Year when you book a table to dine in with Red’s. Non-meat lovers can also indulge, with our epic Meat Free Pulled BBQ Jackfruit Tray. Already booked with us for January? Fear not, you’re covered. Consider it a blessing from us. *Valid 1st – 31st January, against bookings made in advance at any Red’s True Barbecue restaurant. Redeemable against food items from the main menu only. Dine in only and bookings only. Not valid in conjunction with any third parties or any other offer, including 2-4-1 cocktails. Full T&Cs available here.